A promotional map for H.W. 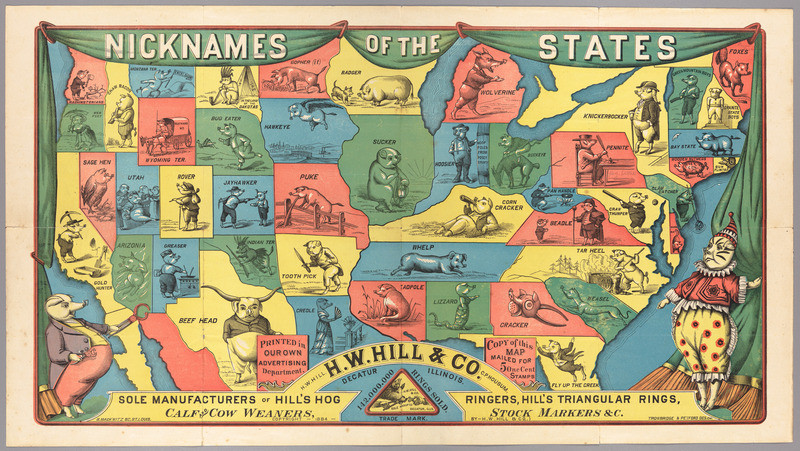 Hill & Co., "sole manufacturers of Hill's Hog Ringers, Hill's Triangular Rings, Calf and Cow Weaners, Stock Markers & c." Each state is shown with a nickname and a hog illustration related to the nickname. The California "Gold Hunter" hog, for example, wields a pick and shovel. A well-dressed pig at the lower left carries the tools of Hill's trade, while the pig at the lower right is dressed as a clown. Some of the nicknames are familiar to sports fans today: Jayhawker, Gopher, Badger, Wolverine, Hoosier, Buckeye, Tarheel. But others are a modern puzzle: Texas Beef Head? Nebraska Bug Eater? Missouri Puke? Illinois Sucker? Alabama Lizard? South Carolina Weasel? Florida Fly Up the Creek? Provenance: Jonathan Bulkley Collection of Advertising Signs & Broadsides. The map is undated; the Library of Congress dates it c.1884.